By **Judith Lindenberger, MBA and Marian Stoltz-Loike, Ph.D.
Today, in our love affair with what’s new, what’s cutting edge, and what’s technologically cool, it’s easy to forget that knowledge also comes with experience. It may require a few hours of e-training or a semester-long course to learn how an energy pump operates, but it takes years and years of experience to recognize the sounds of a pump that is not operating properly. The only way to shorten that learning cycle is to have someone with more experience help to accelerate learning. Businesses idolize youth and technological savviness. Firms recruit new (and less expensive) talent in the belief that that’s the way to build a competitive edge. But companies also recruit and retain mature employees because of respect for their knowledge. The best companies today will help their organizations transform the way they think about all of their employees. Each person brings different knowledge to the organization. Each generation brings something different and valuable to your organizational operations. 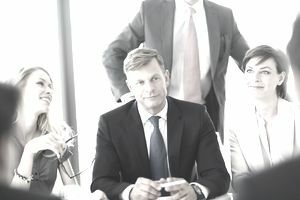 We’ve worked with business people across generations for many years and whether you refer to their sharing of knowledge and information as love, passion, or, more traditionally, as mentoring, we’ve repeatedly tried to foster the powerful synergistic release of cross-generational sharing, learning, and performance. This brings us to the topic of baby boomers as mentors. Baby Boomers is the name given to the generation of Americans who were born in a baby boom following World War II. The Boomers were born between 1944 and 1964. The oldest wave of the Baby Boomers is currently retired, considering retirement options and looking at ways to make their elder years meaningful. The youngest group of Baby Boomers are managing the Millennials and Generation-X groups of employees and in some cases, being managed by them. There are 76 million baby boomers and they represent a great deal of knowledge, talent, and experience. Many baby boomers are looking for new ways to work—and are considering different business responsibilities, new opportunities, ways to give back to their organizations, or avenues for working with younger employees. Research has indicated that baby boomers like collaborative learning and working in teams. Mentoring provides a great opportunity to utilize baby boomers, but only when companies recognize that mentoring is a significant piece of a strategic plan to ramp up recruiting, retaining and increasing the knowledge and skills of talented employees. Younger employees routinely tell us of their disenchantment with their companies as they describe the onerous demands (and opportunities) placed on them by managers who may have confidence in their abilities, but lack the time or skills to help them succeed. Faced with frustration and afraid that they will fail, many of these younger employees tell us that they are planning to move on and look for a more supportive business environment. In fact, the average 30 – 44-year-old has had up to ten different positions. Most businesses could use their more experienced baby boomers, who have deep knowledge, impressive networks, and broad-based business experience, to buffer younger employees against frustration, focus on their career paths, and find places to acquire the skills-based knowledge necessary to succeed. To be effective, mentoring needs to be done strategically and creatively. Here are some benefits and guidelines about mentoring from our experience. Make mentoring a strategic business imperative. Studies show that there is a positive correlation between a positive mentoring experience and an increase in productivity, employee retention and job satisfaction. Effective mentoring, however, is a tremendous time commitment on the part of the employee and the mentor. It will not work unless the company strategically acknowledges the value of mentoring by adjusting the mentor’s other business responsibilities. Modeling from the top also works well. If your head of operations at a particular location is a mentor, it sends a powerful message to employees about the value placed on mentoring, and also the focus on people as the most important part of your business. One senior VP at a financial services firm regularly mentors five or six people unless he feels that his skills set does not match the mentee’s goals. Then he will recruit a more appropriate mentor for that individual. He sets stretch goals for his mentees and then provides them with tools and strategies to meet those goals. He often encourages them or selects them to present in front of senior management using their new skills. Provide new perspectives. Encourage older workers to stop defining themselves in terms of their job titles and start reflecting on the skills they have built, and knowledge that they have amassed. Today, jobs are about more than just upward mobility. Mentors can share their vision and career histories so that younger employees understand what they can learn through lateral career moves and on the job experience. Mentoring can also help mature employees learn from and understand other generations. For instance, younger employees can help baby boomers with technical skills or provide marketing insights about a new generation of buyers. Build skills. Mature workers benefit from being mentors by having the chance to learn more about and practice listening and coaching – skills which require maturity, confidence, and experience to fully employ. Reduce generational conflict. most frequently reported generational conflicts are differing expectations regarding work hours, certain behaviors at work (e.g. use of cell phones), and acceptable dress. Another common issue is feeling that co-workers from other generations do not respect one another. Organizations can reduce generational friction with effective communication, team building, mentoring and recognizing the efforts of all workers. Enable knowledge transfer. baby boomers retire, they take with them volumes of experience and information. Good working relationships between older and younger generations are critical in ensuring that this institutional knowledge is not lost as mature workers retire. The greater the mix of generations in an organization’s workforce, the more important knowledge transfer becomes and the more powerful intergenerational synergy can be. For example, younger employees often push back on managers, questioning the corporate rules and regulations. Typical questions may include, “Why do we have to come to work at 9 am?” or “If I come in late, why can’t I make up the time?” Mentors can often manage, explain and process this information differently and at times more effective than managers. During the 1980s and 1990s, many companies laid off significant numbers of employees. Now organizations are faced with large numbers of employees getting ready to retire and the need to onboard younger workers and quickly move them up to supervisory and managerial positions. Younger managers may come to their new positions with little or no business-related experience and have trouble building their own credibility and integrating and respecting the knowledge and talent of mature subordinates. Mentors can help these new managers develop business-related understanding and strategize about using the talents of more experienced employees. In our experience, we have seen baby boomers who are reluctant to mentor younger employees because they are afraid that once they share their knowledge, they will become extraneous and lose their jobs. In fact, in today’s fast-paced business environment, it is the SMEs (subject matter experts) who can capably and articulately share what they know who are the most valuable to their organizations. Here are some tips for encouraging baby boomers to pass on organizational knowledge. Reward, don’t punish, mature employees for mentoring. To entice baby boomers to become mentors, organizations should reward and recognize them for their contributions. Talk up mentoring in meetings, in speeches, in newsletters, in performance appraisal discussions and include mentoring in corporate awards programs. And, most important, don’t replace mature mentors with their mentees before they retire or mentors will quickly conclude that being a mentor is a very bad idea. Ask mature employees about someone who enabled them to succeed. In one study of people who had experienced effective mentoring, half of them said the mentoring experience “changed my life.” Those are powerful words. It is equally powerful to know that you were the person who changed someone else’s life. Continue mentoring past retirement. The trait most attributed to baby boomers is the willingness to give maximum effort. Baby boomers are also rated as highly results-driven, very likely to retain what they learn; and low on their need for supervision. Many baby boomers plan to work at least part-time past the traditional retirement age. These characteristics show baby boomers to be eager workers who may be well suited to be brought back as consultants and mentors after their retirement. Mentoring is a process that is compatible with baby boomers’ values and work style. Mentoring involves being collegial, talking, sharing (not telling), and developing solutions together. It is also optimistic, which is typical of most baby boomers’ outlook on the world. We’ve found that when generations work together in strategic, business-related activities such as mentoring, everyone benefits. The mentee builds new business knowledge, and the mentor often gets reenergized and reengaged in business opportunities. We find unique satisfaction in nurturing these synergistic relationships. One last point: The business knowledge of 20-year-olds and that of 50-year-olds is profoundly different. The technology facility and ability to multi-task among 20-somethings are unparalleled and impressive. But the knowledge, experience, creativity and business acumen of 50-somethings is also unparalleled and equally impressive in a very different way. Cross-generational mentoring provides one of the most significant ways for integrating these diverse abilities. As author Studs Terkel, who died in 2008 at age 96, said, “Think of what's stored in an 80- or a 90-year-old mind. Just marvel at it. You've got to get out this information, this knowledge, because you've got something to pass on. There'll be nobody like you ever again. Make the most of every molecule you've got as long as you've got a second to go." **Judith Lindenberger is a two-time recipient of The Athena Award for Excellence in Mentoring and president of The Lindenberger Group, LLC. Contact her at 609.730.1049 or info@lindenbergergroup.com. Marian Stoltz-Loike, Ph.D., is the President of SeniorThinking. Contact her at Mstoltz-loike@seniorthinking.com. How Do Leaders Set the Pace in the Workplace?